PRE-SALE LISTING - CURRENT RELEASE DATE IS APRIL 17, 2019. This listing is for one. Factory sealed case, which contains 12 factory sealed boxes. Each factory sealed box contains 24 sealed packs with 5 cards per pack. Each box guarantees one complete 72 card base set. With detailed plot synopsis for all Season 1 episodes. And 2 authentic hand-signed autographs. Also look for randomly inserted Insert/Bonus cards! The case also includes an exclusive case topper card inside! Dylan Kenin (Krill Captain Haros). 8 Mirror Bridge Crew Parallel Cards. 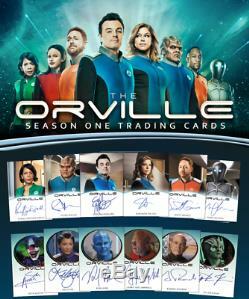 9 Tour The Orville Cards. Purchasing more than one item? We aim to be transparent with our business practices and reading the information below will be of great help to you when placing an order with us. When you order from us you will find that your order will come to you well packaged, whether its a single autograph, a complete base set, a binder, a sealed box of cards, or a master set. All of the items we sell are in NEAR MINT condition or BETTER unless it is specifically otherwise noted in the listing description. Nearly half of our business comes from our friends outside of the United States and we welcome orders from around the world! They are also insured so in the rare event of damage or loss, we can quickly get a replacement out to you. 4 PRE-ORDERS : We generally begin accepting pre-orders for products about 30 days from the release date. If an item is not in stock and is a pre-order, this will be clearly noted in the item's description along with the current release date. We have been in business since 1997 serving the gaming and trading card collecting community. We are a distributor for Rittenhouse Archives and specialize in their entire product line, including sealed boxes/cases, hand assembled base, insert, mini-master, and master sets, and also singles such as autographs and sketches! We strive for top notch customer service to earn loyal customers who will return again and again to complete their collections! We also strive to be the most competitive company in the market and will match or beat ANY competitor's price! We first began business under the name Picard's Grand Auctions and then our new name in 2004 when we moved to the Bushkill Township-Nazareth area. And yes, we are named after a geographical place and not politically or otherwise oriented! In 2006, we added Star Trek trading card products by Rittenhouse Archives to our catalog and then expanded to their entire product line. Finally in 2011 we opened a brick and mortar retail location and grew from 1 employee to 7 in order to keep up with the steady stream of orders! 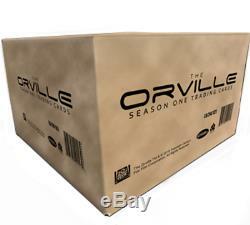 The item "The Orville Season One Factory Sealed 12 Box CASE -24 Autographs Season 1" is in sale since Sunday, March 10, 2019. This item is in the category "Collectibles\Non-Sport Trading Cards\Sealed Trading Cards". The seller is "bushkill_cards_and_games" and is located in Wind Gap, Pennsylvania. This item can be shipped worldwide.